Buildings are both a complementing to population, as they too can produce resources (money, manpower, metal, etc.) 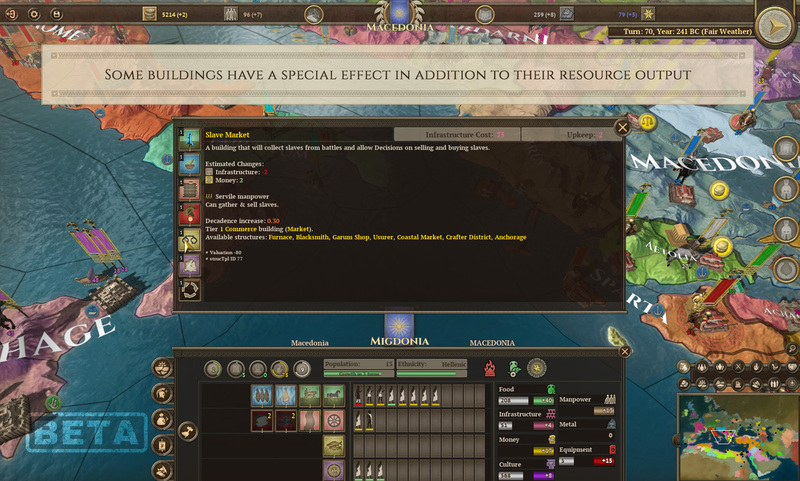 and have unique properties and aspects which complement each other and affects every sector of the game. Indeed, you can bet that with around 400 different buildings, there is one for each situation, from a mundane cattle ranch, to a more impressive trade emporium, to the complicated (in its usage, not its understanding) Black Market with its variety of intriguing effects.But before digging into some of the benefits they offer (and we won’t give a comprehensive list there, because of the sheer magnitude of possibilities), lets talk of how they are built, as this is a gameplay mechanism that diverges from what you usually encounter in most strategy games since the beginning of the (computer-gaming) world and Sid Meier’s Civilization I appeared at the dawn of it. As you can see, there are 6 buildings categories: Agriculture, Health, Infrastructure, Military, Commerce, Culture. For each of these categories, a choice is offered to you, in the form of a specific building. The list is far from being random though, although there is a random element as to what choices are available. What you are shown heavily depends of what you have already built in the region (including whether you opted to specialize the region or not?). What is the current population. If the region is a plain, in forest, bordering a sea. What is your government, your ethnicity. And so on. 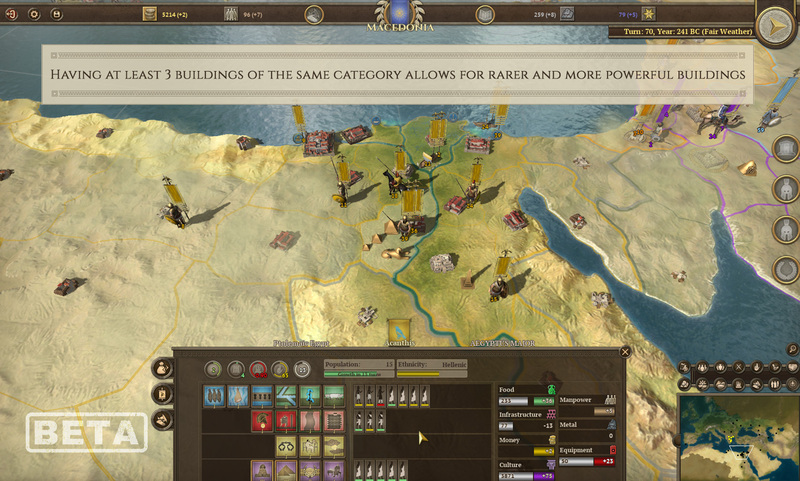 As you know, having meaningful choices is at the core of a good strategy game. Here too, you’ll have to weigh and decide which building you want the most from the 6 you have available. Will you want a wall to be built, because those pesky tribal raiders find your land such a pleasant place to be? Do you prefer to prioritize a ranch, to increase your food production while producing cattle you want to export? Choices … And they will be at times very difficult to make because intrinsically, all buildings provide benefits! And as soon as you have finished your current buildings, all choices are reshuffled. So the improved walls you wanted, and the less desired commercial harbor might not reappear the next time (rest assured, they are still there and the option is not lost for ever!). To help you decide and handle your construction plans, you have a few tools at your disposal though. First, you always see the complete list of possible buildings, for each category. This helps you to decide and plan ahead. Second, there is a reshuffle button, for the time where none of the buildings are what you want. The Reshuffle action don’t cost a lot and will probably be done in 1 to 2 turns in your region (and the code is smart enough to not propose again the same buildings as the previous list). Finally, you get another tool through a National Decision (more on that later) that will force the focus of your nation to particular types of buildings among several categories. So in the end, you have substantial control over what your regions will be made of, but this control is not complete. Hopefully you’ll come to appreciate this system, as it prevents players from being stuck doing always the same things in most of their regions (and that’s also why you get so many different buildings). To help you picture how diverse the buildings are, we will provide a few examples. The Vineyard is an agricultural building generating some income, plus the Wine trade good, that can be used by your own taverns and palaces or exported for profit to your neighbors. It is restricted to warm climates though. The Sanitation system is a Health building. 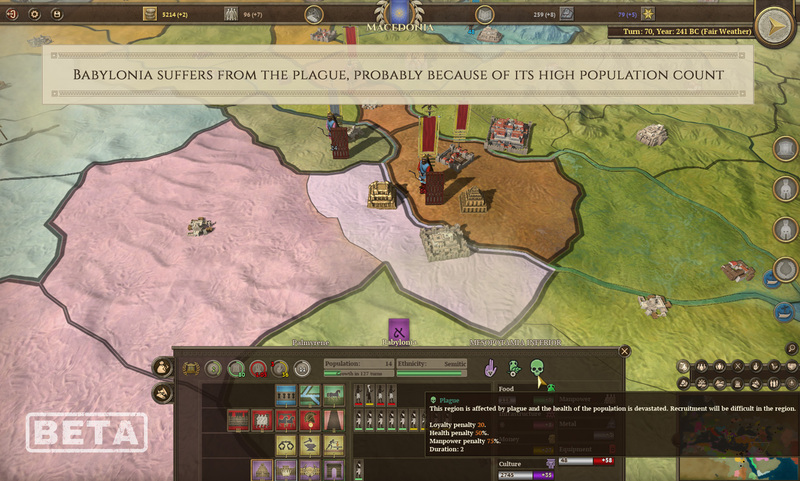 As such, it will speed up population growth and prevent (most of the time) bad events like disease and plague in the region. It can be upgraded to a Sewer network. The Shrine to Epona is a military building, a building only available to Celtic nations. It will improve slightly the cavalry units recruited in the region, and should you manage to build the 4 different Celtic shrines in a region, then you are in for a nice surprise (some games would name that a ‘finisher bonus’). The Land Expansion is a rather special building that provides more room for even more buildings in the region (because you have a limit on the number of structures based on your population amount, this one increases it nicely). The Satrape Palace is a provincial palace. We will talk about Provinces in another diary, and each has a palace acting as the provincial capital. But the Satrape Palace, a building unique to the Seleucids does a few other things. As a drawback, it costs a lot (and really a lot!) to maintain, to represent how easily the appointed governors (former generals of Alexander the Great for many) adopted the extravagant life style of the Persian empire. But it has benefits too: It allows the levying of powerful local militias, should the region be under attack. If not, then it provides free units to the national army of the King of Kings. We will end up there, with this Seleucid Palace. That’s a tier II building, i.e. a building that is a bit more complex and involved than tier I buildings, like the vineyard, the cattle ranch and so on. We will let you discover the variety of effects of tier III buildings in-game, including the national unique and world wonders we have for you. In the meantime, stay tuned!